Sarah Glassman is an actor, singer, songwriter, teacher, and pianist, whose work has enabled her to become one of the most versatile artists in NYC. Originally from Western Kansas, Sarah began playing piano before she could read a book. Considered a child prodigy, she quickly advanced to studying classical piano at the collegiate level under professor John Huber. By the time she turned 12, Sarah had a professional career in the Catholic Church as an organist/pianist. During her college years, Sarah discovered her passion for singing, and went on to receive a B.A. in classical voice from Fort Hays State University under Juilliard Grad, Dr. James Brown. Sarah moved to NYC in 2006, and was immediately hired as a music director for cabaret shows at Don’t Tell Mama’s. She then went on to play the role of Rapunzel in a regional production of Into the Woods, followed by an honorable performance at the Waldorf Hotel which honored Patti Lupone. She soon thereafter began studying voice with world renowned vocal coach Professor William Riley. It was Riley’s teaching technique that inspired Sarah to begin educating others as a private vocal coach throughout the Tri-State area. As a music director, Sarah’s sight-reading skills have provided her with endless opportunities to work with artists of all genres. She most recently received two 2018 Josie award nominations for Music director of the year for her work on the regionally produced productions of Something’s Afoot and Joseph & the Amazing Technicolor Dreamcoat. Sarah was the only female nominated in this category and was also the only music director to be nominated twice. Sarah’s work as a private vocal coach has done nothing but provide her with joy. She shares her knowledge at From Stage to Screen performing arts school on a weekly basis, and also coaches privately in NYC. Sarah’s students have gone on to book national tours, regional tours, and have also performed at professional ball games. In 2015, Sarah formed the Sarah Glassman Band, and released her debut EP Toxic, which can be found on ITunes and Spotify. She is currently working on producing a new EP, intended to be released as early as fall 2018. As a performer, Sarah regularly performs in NYC piano bars. You may find Sarah at Uncle Charlie’s Piano lounge on Sunday nights, as well as MC58 Bar on Mondays. Both venues are located in Midtown East, not far from Grand Central Station. 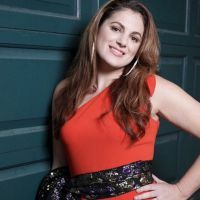 She also consistently works with established songwriter and musical composer Sammy Bravo and regularly collaborates with indie singer/songwriter Anna Volpe. Sarah most recently founded HiGlass Productions with her colleague, seasoned performer Ryan Hiers in 2017. It’s within her production company that Sarah spawned the Nasty Women Cabaret series, which has provided a platform for people to experiment with new material in a safe, inspiring environment. Sarah is also co-writing an original musical with Hiers which is going to be workshopped in the summer 2018.